The mill opens on weekends and Bank Holidays from April until the end of October. Opening times are 11am to 4pm, with the last tour starting at 3:30pm. Visitors are taken on a guided tour around the mill. Tours take approximately 40 mins. Please note that access to the upper parts of the mill is via steep stairs, although there is easy access around the outside of the mill together with glorious views of Derbyshire countryside. 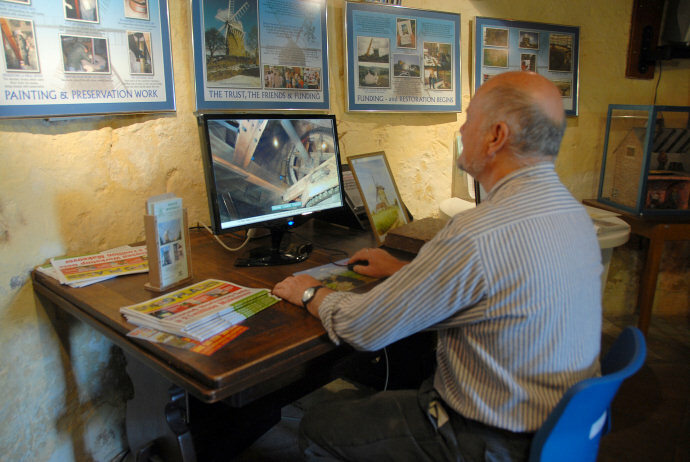 A computerised presentation of the mill machinery – in the undercroft beneath the mill – is also available and accessible to visitors with a tour ticket. 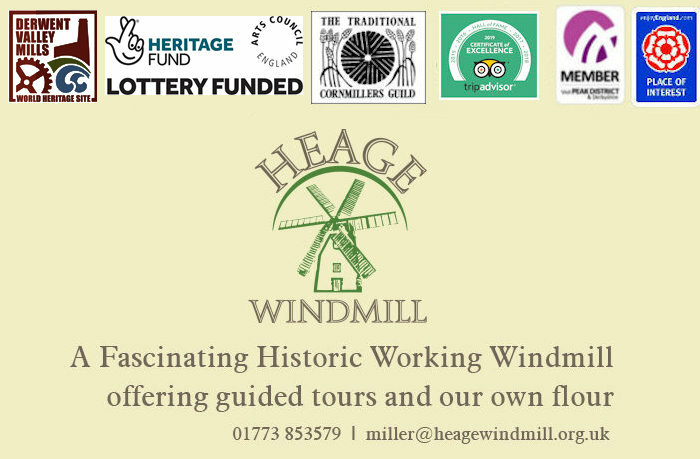 The history of Heage Windmill, how the miller controls the mill, how stoneground flour is traditionally milled along with many anecdotes about the life of a miller. We will happily arrange a special group visit. 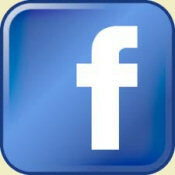 For parties of up to 10 people, there is a minimum charge of £50.00. For each person after this, the charge is £5.00. These visits are normally arranged outside our regular opening hours. We can offer you the unique, exciting experience of being ‘Miller for the Day’ and working directly with a skilled miller. If you are interested – whether male or female – you need to be reasonably fit and able to climb the steep mill stairs many times during the day. You will need to be at the mill from about 10.15 am to 5.00 pm so you can learn how to set up, operate, and close down the mill. In so doing, you will become familiar with parts of the mill not normally open to visitors. If the wind is blowing, we may even be milling flour! If you are interested, please contact Lynn Allen on 01773 715 177 (mob 07973 548 551) email lynnallen13@hotmail.com. or fill out a registration form by clicking here – HWP 026D- M4 Miller for Day Registration We make a moderate charge of £60 for the experience, the proceeds going into the mill maintenance fund. Pre-booked school visits can be booked from Monday to Friday when the mill is closed to the public. The charge is £40 for up to 28 people (including adults). This charge also applies to visits from Scouts, Brownies etc., or if the visits are of an educational nature. Here is a wonderful opportunity for your pupils to discover the fascinating history of the age-old practice of milling grain. A guide will lead you around the mill to make your visit more interesting. We ask that visitors are careful and follow the guide’s advice at all times. 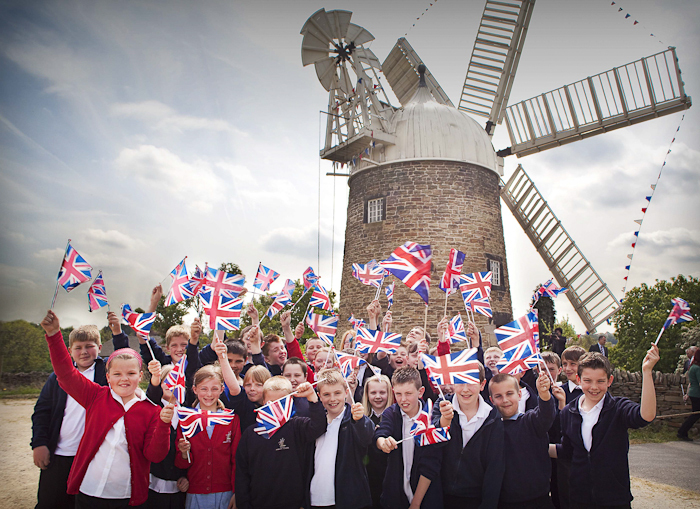 A visit to the windmill provides excellent curriculum material for subjects such as Healthy Eating, Design Technology and Local History. You will need to include an adult with every six children (minimum) in your group. Access to the inside of the mill is limited to fifteen people at one time. 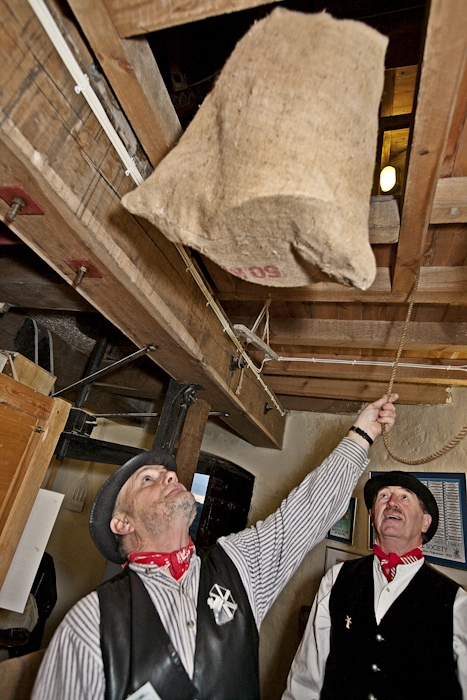 Our guides are experienced at involving children in ‘hands on’ activities leading them through the story of milling. Risk assessments are available for your visit. After the tour, your party will be taken to the undercroft, which is the interpretation centre. There is a video telling the story of milling, a model of how the grain was dried ready for milling, and the history of Heage Windmill in information panels around the room. The drying kiln is now the visitors’ centre, with a shop selling souvenirs and a small range of drinks and ices. There are toilets including a disabled toilet. There is wheelchair access to the ground floor of the windmill, the interpretation centre, and the visitors’ centre. If you are interested in booking a school party, please contact Lynn Allen 01773 715 177 (mob 07973 548 551) or email lynnallen13@hotmail.com and we will endeavour to make suitable arrangements for your visit. If you are getting married locally – or know of someone who is – the Friends of Heage Windmill offer the opportunity of using our windmill as a backdrop for wedding photos. Furthermore, every bride photographed at the windmill will be presented with a hand pyrographed and decorated wedding spoon. All we ask for is a minimum donation of £25 which covers the cost of the wedding spoon and helps towards the upkeep of the mill. 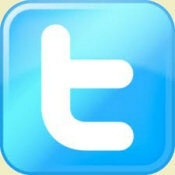 £25 covers any photos taken during the weekend. If the photos need to be taken in the week, we ask for a donation of £50. The mill is located off Chesterfield Road just to the north of the Derbyshire village of Heage. The entrance road is opposite the Bowmer and Kirkland offices. Car parking is available free on site. Post code is DE56 2BH. Andy Savage of Derby Photos has filmed a drive from Belper to Heage Windmill in HD Time Lapse. Click here and fasten your safety belt. Leave M1 at junction J28 and take the A38 towards Derby and Matlock. Stay on A38 for about 6 miles. Take the exit signposted Ripley and, on the roundabout, take the fourth exit to Ambergate, A610. After about a mile you will reach traffic lights. Just after the lights, take a left fork (past the Excavator pub). Follow the B6013 for less than a mile. The windmill entrance is on the right, opposite Bowmer and Kirkland offices. From the south, travel north on the A38 and leave the junction signed Ripley A610. Take the first exit and then proceed as above. If travelling from the South, take the A6 North out of Belper. If travelling from the North , take the A6 South out of Cromford and Whatstandwell. At the North side of Ambergate take the main road opposite the Hurt Arms. After less than a mile take the first right signposted Heage. After some two miles you will come to the end of this road at a T-junction. Turn left. You will shortly go up a steep hill. At the junction at the top turn left, then left again. The windmill entrance is after the rows of houses on your left, and opposite Bowmer and Kirkland offices. Please note the wind speed. If it is more than 5 or 6 mph, then normally the sails will be turning.